A few MacBook Pro 2018 and MacBook Air 2018 PCs may experience sudden flickering of the screen, where the backlight of the display starts blinking and flickering. That can be a cause for concern, as flickering is often related to a hardware problem. But in this scenario, the problem could be related to the software. We did some research and found that it could be due to issues with certain settings on these Mac computers. While these sort of problems are a rare occurrence, we’ll tell you how to reinvent screen flickering on the victim hardware of 2018 MacBook Air, as well as share a few tactics known to prevent it from happening. If the 2018 MacBook Air is affected by the issue of screen flickering you probably have spotted the malfunction by now, as there is a non-subtle flicker on the display. If you didn’t, you may want to see if it happens on your specific Mac 2018 laptop. Below we share three different methods that should reproduce the issue. Place your MacBook in a room that’s brightly lit, for instance, where its display is reflecting the sunlight. While a reflection appears on the screen, switch the brightness to about 50%, and then crank it up to the maximum. Or, place an iPhone flash light in front of the front-facing camera where the sensor of the ambient light is meeting the display’s top, then wave the thing around for a bit so that the sensor sporadically gets hit by the bright light. Or, in a bright room where the reflection of the light is casted on the display of MacBook Air, increase the brightness to a maximum, then swiftly open and shut off the lid but don’t do it all the way to result in sleep. Alternatively, take the laptop and wave it here and there so that the display glass receives a moving reflection. We tried this and were able to reproduce screen flickering consistently with a shining off flashlight onto the display’s top, and using glare tactics and with a bright room on the MacBook Air 2018 model BTO w/ 512GB SSD and 16GB RAM). Of course, seeing the screen flickering happen on a new Apple laptop isn’t a welcome sign, as usually this along with display buffering may indicate a hardware problem. Nevertheless, consider getting in touch with Apple if you think it’s related to hardware. MacBook Pro and MacBook Air 2018 often fall under the general warranty, so that’s a valid consideration to make. There are two potential solutions for the screen flickering problem, both of which assume that it’s a software problem rather than a hardware one. Note that these methods are likelier to resolve the issue than resetting PRAM/NVRAM or resetting the SMC on the MacBook Air 2018. 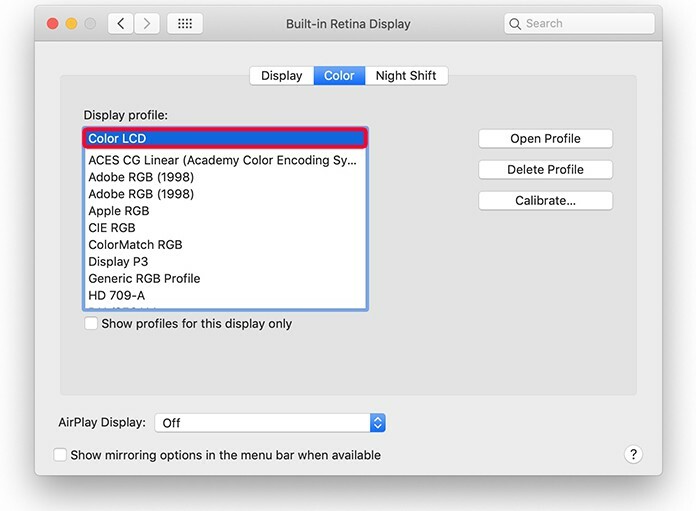 If you’re using a display profile that’s custom calibrated, use the “color LCD” display profile in default setting. This can be changed in the “Color” areas of the preference panel for “Displays” inside System Preferences. Once you do, reproduce the screen flicker with screen glare or flashlight as we discussed before. 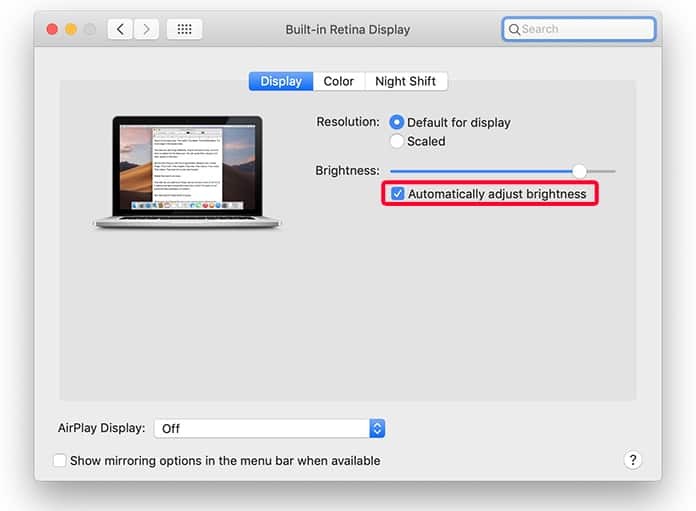 Deactivating MacBook Air’s “Automatically Adjust Brightness” setting could end the screen flickering once and for all, irrespective of any screen glare or bright light, or requiring the flashlight method. This setting can be toggled on or off in the “Display” area of the Displays preference panel inside System Preferences. Though this isn’t likely to be a cause for concerns, it impacted enough MacBook Air Retina owners to raise eyes in forums and threads. Below is a three second video demonstrating the problem when a flash light is leading to screen glare at the display’s top. And perhaps relevant is another problem displayed in the below video for 2018 MacBook Pro, of which several reports have surfaced online, even though it’s unclear if the same issue is causing screen flickering, or it can be reproduced using the screen glare or flashlight method from above. So if you have a MacBook Pro 2018 or MacBook Air 2018, and any randomly flickering issue arises, try the methods above such as deactivating backlight adjustments. And if all else fails, try contacting Apple and one of their Geniuses should be able to get the job done. Follow these tips and you’ll free the device from the confines of screen flickering forever.